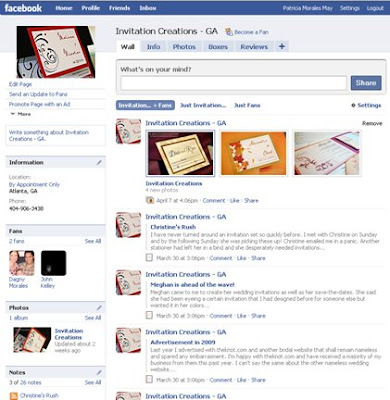 Invitation Creations, LLC Blog: Invitation Creations is now on FaceBook! Become a fan ...We're on FaceBook! I find myself on FaceBook when I need a break and discovered that I get a lot of breaks! So, with all the business pages on FaceBook, I thought I would give it a try! If you are a previous client, this would be a great place to write a review of my services.